What is a Boat Club? Welcome to Freedom Boat Club of the Golden Isles! Our fleet of boats enables you to experience the breathtaking scenery which encompasses the Golden Isles. 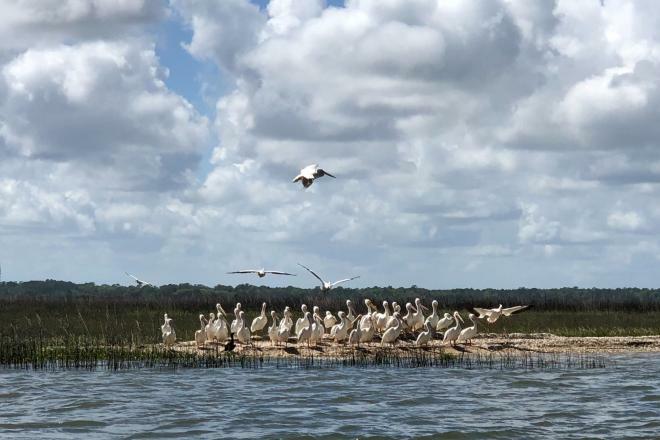 A paradise comprised of four barrier islands separated from the mainland by a belt of tidal marshes of Spartina cordgrass, the Golden Isles sits among the most extensive and productive marshland system in the United States. Wide, open-water sounds form natural breaks in the marsh, and serve as gateways to the ocean. The four barrier islands are Jekyll Island, St Simons Island, Sea Island and Little St Simons Island, all of which can be explored by boat. Further south is Cumberland Island, which can only be visited by boat. Fishing is in abundance in the marshland waterways, inlets, and in the Atlantic ocean. Dolphin watching, allegator spotting, and tubing are popular boating pursuits. Freedom Boat Club is located at Morningstar Marina, St Simons Island, conveniently situated just as you enter St Simons Island from the Causeway. Our base within the Marina includes a ships' store and bespoke training room. The marina complex has a swimming pool, restrooms and showers, and Coastal Kitchen, a popular restaurant and bar. St Simons Island regularly wins national awards for its beauty, Southern charm, and culture. A short drive or bicycle ride from the marina is the Village, which features numerous restaurants and one-off boutiques, and the St Simons Island Pier and iconic lighthouse. Pristine beaches, historical sites, and an abundance of golf courses creates the perfect retreat.